North Carolina Sea Grant will lead a partnership to develop aquaculture career materials, thanks to new outreach funding from the National Sea Grant College Program. The national program, within the National Oceanic and Atmospheric Administration, today announced $3.4 million in federal funding to support aquaculture research and outreach. The new portfolio includes 11 aquaculture research projects and 23 projects to transfer aquaculture information, with the federal dollars leveraged 2:1 with matching funds. “Sea Grant’s research on aquaculture continues to advance the field in promising and sustainable ways, and this latest round of aquaculture research grants is no exception,” explains Jonathan Pennock, director of the National Sea Grant program. “An important and often overlooked area is going beyond research to integrate useable science into people’s everyday lives. The conferences and workshops funded this year will contribute to filling that gap,” he adds. 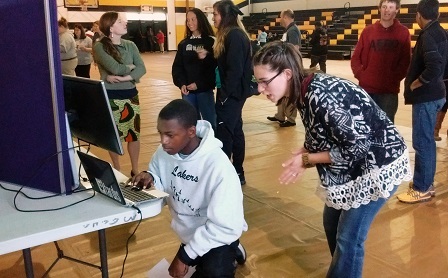 Jenny Holder, right, helps a student at Mattamuskeet Early College High School navigate North Carolina Sea Grant’s oyster story map. Photo by Diana Hackenburg. The project, Building the Marine Aquaculture Career Pipeline, will receive nearly $19,900 from National Sea Grant, and more than $10,000 in matching funds from Carteret Community College, for the development of educational materials, as well as events at coastal high schools. The project builds off aquaculture career day events that Sea Grant has piloted in Hyde County, working with a variety of partners from coastal marine research labs, government agencies and nonprofit programs. The new two-year effort is led by Jane Harrison, North Carolina Sea Grant’s coastal economist, along with Sea Grant extension colleagues Chuck Weirich, aquaculture specialist, and Terri Kirby Hathaway, marine education specialist. They are joined by Dave Cerino of Carteret Community College in Morehead City. “We are excited to develop a series of training and information-transfer activities, including events that connect high-school students to local aquaculture businesses, as well as lesson plans for teachers,” Harrison notes. For more information on the National Sea Grant announcement — part of Sea Grant’s overall effort to support the development of environmentally and economically sustainable ocean, coastal and Great Lakes aquaculture — go online to seagrant.noaa.gov. Eleven new research projects totaling $3 million in federal funds include a study on managing the complex profile of biotoxins threatening the shellfish industry of lower Chesapeake Bay. The 23 outreach projects total $400,000 in federal funds, including a South Atlantic Shellfish Initiative Planning Workshop, to be hosted by South Carolina Sea Grant. The National Sea Grant College Program announces three new federal funding opportunities for aquaculture projects. An informational webinar about the competitions will be held on Monday, March 4. Oyster reef restoration, aquaculture and wild harvests are among the topics for the 2019 North Carolina Oyster Summit that will be held March 12 in Raleigh. North Carolina Sea Grant research and outreach projects will be among those highlighted.